dutch pancake: That's what neighbors are for! That's what neighbors are for! 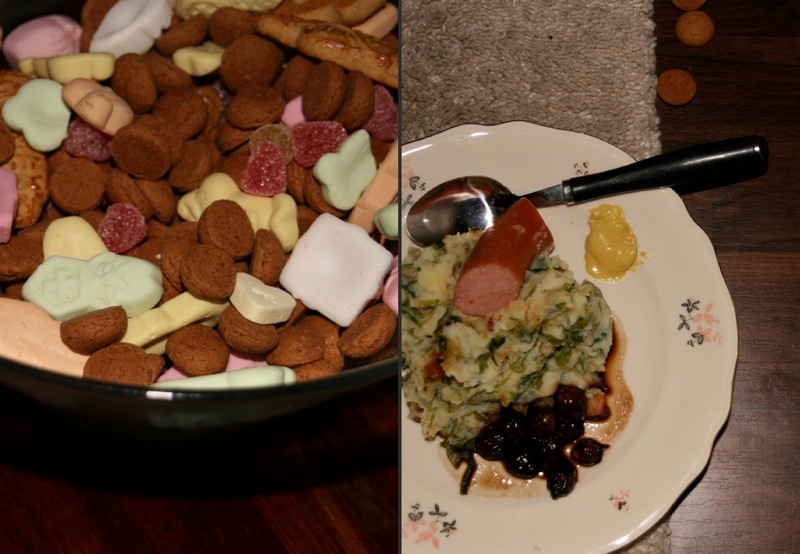 Our neighbors invited us to a family-style celebration of Sinterklaas on December 2, four days before the real 'celebration.' It was right next door and how could we say no to some true Dutch culture in our lives?! Plus, our neighbors are just awesome and I've enjoyed their company on multiple occasions, usually involving lots of red wine, gourmet food (Klaartje is a chef), and plenty of laughs. And they make me practice Dutch as well. Good people. We started the evening with a typical Dutch dish called boerenkool that Klaartje and her dad made. It's basically a leafy green like kale mixed in with lots of mashed potatoes. It's topped off with rookworst, or smoked sausage. Klaartje also made these incredible baby onions, pickled in aged balsamic, to eat along with the main. Delicious! A little mustard and an Heineken went along well, too. After everyone was finished eating--and had started snacking on the pepernoten, taai-taai, and speculaas, which are all some sort of spiced cookie-like thing--we all of a sudden heard a loud knock on the front door!! WHO COULD IT BEEEEEEE?!??!?!?! 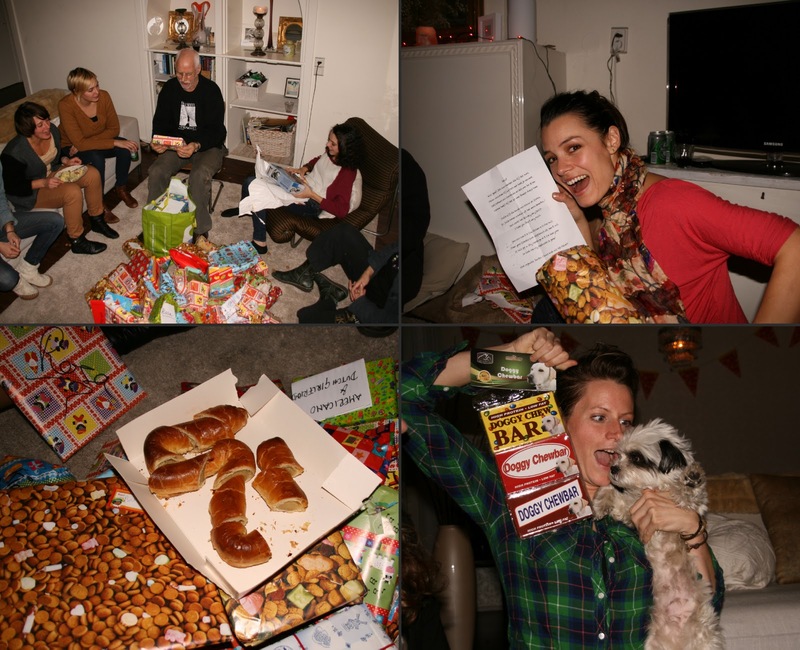 Of course, it was Sinter Klaas! He had several large bags with him, filled with tons of gifts to share. Before any gifts were distributed, he had to make sure to tell us all the naughty things each of us did this past year and how to improve our behavior for the coming year. So he got out his special book and read aloud for all to hear. Finally, we all sat down again and Sint emptied the bags onto the floor--so many presents!! It filled the whole living room. I was really, really shocked. One by one, people opened their gifts and read the accompanying poems aloud as well. 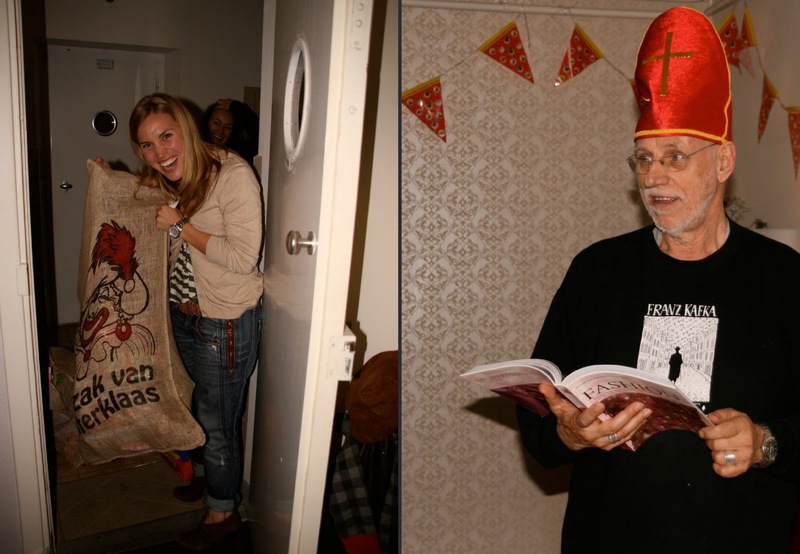 Remember, all the poems are signed by Sint so you never know who gave you some of the gifts! We even had a poem to read--in Dutch of course--and presents to open. We got a new door mat, candles, a DIY gingerbread house (awesome! ), chocolate letters, and a new wallet and coin purse. It was so touching and heartfelt--I told you I have the best neighbors! Chocolate letters (the first initial of your name), good times, and a new door mat! Hello neighbours! Here a reaction of Sinter Klaas en Zwarte Piet. 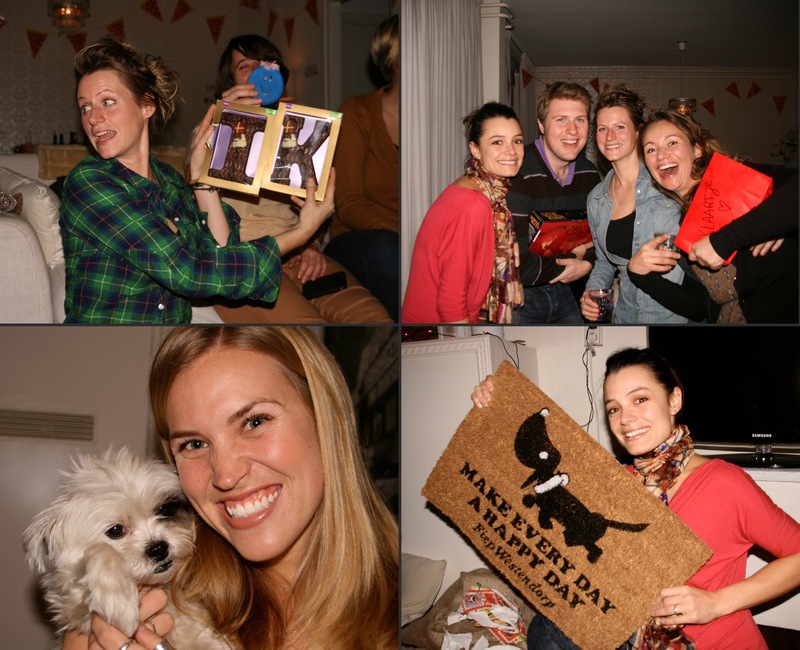 Very nice to read your enthousiastic comments about the big Sint evening at Klaartje and Ilonka's place. And also to see the cosy photograph's. We are happy to see you enjoyed it so much. We hope you are oké in the new flat for now and that you two will have a lovely wedding in spring with your families and friends! Warm wintergreetings, Nico(laas), Rosa and Jet.